Using botanical guides, children's storybooks, and cartoons as his inspiration and source material, british-artist Paul Morrison creates large-scale monochrome landscapes that have been described as "Disney without the characters." Not unlike Alice's psychedelic-tinged Wonderland, many of Morrison's hypnotic fantasy environments seem to pivot between innocence and malevolence in the blink of an eye. Morrison alters our sense of scale, perspective, and positive-negative space to create visually striking compositions. Spiky brush and trees often obscure the view beyond the immediate foreground. Dandelion plants and other flora are enlarged to many times their normal size. Referencing Pop art and Op art as well as neo-romantic bookplate illustrations and the graphic art of Aubrey Beardsley, Morrison's Pop-naturalist landscapes flirt with abstraction in jarring and unexpectedly seductive ways. Paul Morrison was born in 1966 in Liverpool, England. He received a B.F.A from Sheffield City Polytechnic in 1988 and an M.F.A. from Goldsmith's College of Art in London in 1998. 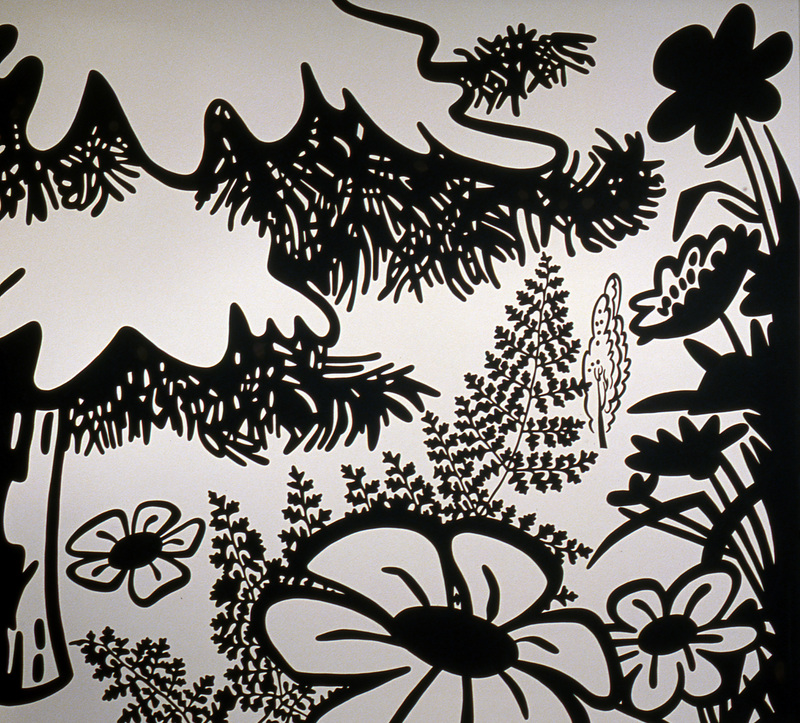 His work has been shown in the United States at Harvard University's Carpenter Center for the Visual Arts, the Birmingham Museum of Art in Alabama, and The Drawing Center in New York, and in Europe at the ICA London, MUHKA in Belgium, Inverleith House in Scotland, the Wüttembergischer Kunstverein and the Kunsthalle Nürnberg in Germany, and the Stedelijk Van Abbemuseum in Holland. He is represented by Asprey Jacques, London, and Michael Janssen, Cologne. Paul Morrison paints "only trees," and he paints them only in black-and-white. That is, he limits the contents of his paintings to trees and flora, framed by fences and hills and snippets of grass or weeds, seemingly congruous elements that he makes less plausible—by mixing up the schema, scale, and perspective—and less naturalistic, by reducing his palette to the unmediated opposition of black and white. Like many of the London-based artists of his post-Sensation generation, Morrison has chosen painting as his modus operandi. This has meant that unlike the "Young British Artists," whom he follows, he tends to be compared not with other Londoners, but wih other painters, not all so young: Patrick Caulfield, Takashi Murakami, Carl Ostendarp, Monique Prieto, Michael Raedeker, and Daid Thorpe, among others. Like Morrison, these artists have been featured in numerous international shows in the last few years and have fueled new debate on the viability of painting circa 2000. The pictures they make in the name of a new painting mix mediums and genres, and employ the exaggerations ad obvious schematic effects more typical of commercial and cartoon imagery. They differ significantly from those of an earlier pop generation, however, in which high and low were clearly opposed, and are closer to their digitized, pixilated, virtual cousins, in which figures and forms re forever threatening to transform or dissipate. Morrison is an active player in this arena. His paintings feature an ever-growing vocabulary of appropriated firs and willows and cartoon copses drawn from sources that range from Chip 'n Dale to Dürer to botanically correct, which he alters subtly—mixing and cropping, enlarging or reducing at will—and makes his own. Morrison also mixes compositional devices. His mismatched flora may be viewed from on high, radically foreshortened behind a baroque "repoussoir" of looming dandelion leaves; framed by a Warhollian faux-wood banister; or veiled under an agitated, hard-edge rendition of alloer ab ex gesture. 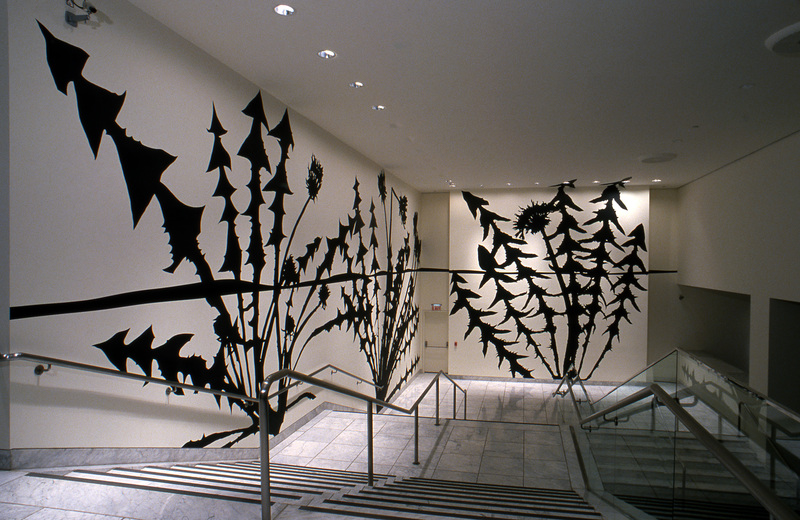 Technically his graphic, silhouetted shaped and a production process that entails computer scanning and slide projection make his medium a hybrid, yet he choses to work in paint, with brushes. "Nobody had talked about how they are constructed," Morrison once said to me. And he's right; the surfaces he orchestrates are highly refined—dense and luminous and gorgeously seductive. Nobody talks about the space he builds, either. Morrison manages to hold yards of seemingly uninflicted paint in tension with the perfect placement of a lonely moon or tree. Alternatively, when he covers his surfaces, as he has done in some recent paintings, with an allover thicket of lines, he makes our viewing a kind of voyeurism, as we peer through the tangle for a glimpse of the distant scene behind. Morrison eschews such metaphoric elision: his dandelions may encroach upon his willow trees, but there's no chance that one could ever become the other. Much like the painter Jack Wesley, an artist Morrison admires tremendously, whose "Dagwood" men and "Blondie" women remain forever separate in their tug of desire and indifference, Morrison creates botanical specimens that are once distinct an inscrutable. Every element seems not so much intentional as inevitable in its form and placement, but the apparent integration intimated by landscape and the black-and-white palette is deceptive. The methods Morrison has worked out for himself—variations on what seems to be a rather rigid set of givens—are not untypical of his post-Sensation generation, many of whim have opted to provoke sensations along lines suggested by the optically charged, disciplined painting of a Bridget Riley. The dilemma becomes how to move from the narrowness of optical abstraction to "something beyond itself," out in the world.3 Like Riley's, Morrison's art is informed significantly by other art; his paintings relate to a world outside themselves by analogy, as do hers. But his use of schematic representations, or "figures from nature," complicates the dialogue and points to other sources. This recognition makes sense of Morrison's curious interest in Robert Gober, whom he brings up when he talks about composition.5 When Morrison talks of Gober, he talks as a painter. He is enormously moved by the relationship Gober constructs between his perfectly placed, enigmatic "figures" and the equally enigmatic "grounds" he fashions by building rooms for them—his capacity, that is, to reconstruct not just the objects that index his life but also the settings in which those objects can be rewritten. Limiting himself, as he does, to his cast of trees, Morrison maps out scenes in which disparate species cohabit without ever pretending to comprehend one another. (Look closely at the havoc wreaked by his dandelions as they cozy up to a fruit tree's roots or scatter their seed over unsuspecting fields.) His painted settings are fraught with anxiety yet are more utopian and less pointed in their critique than Gober's sculptural installations. Morrison's trees reveal none of the trauma embodied in Gober's refigured objects, but he is no less intent on envisioning an environment that is neither spectacular nor normatively "natural." When the maverick British film critic Kenneth Tynan jotted the journal entry quoted at the beginning of this essay, he was bemoaning he limitations of film as he knew it, calling for a "pure cinema" modeled on cartoon or drawn and painted settings. The painterly cinema he envisioned was one in which new worlds might be conjured, one that would surpass both Disney's cartoons, which merely affirmed the status quo, and Hollywood's reliance on the representation of "newsreel" photography or the spectacle of theater. Tynan's speculation helps to reveal just how visionary Morrison's project really is and, ironically, despite the careful brushwork, just how hybrid are his methods. Morrison's "paintings of trees" actually began as much simpler send-ups of Disney-inspired cartoons. His efforts to reconceive painting through his elegantly de-natured landscapes have deepened and grown more difficult, in large part because he has graduated from the Disneyesque practice of simulating familiar worlds to something more truly imaginary, approaching Tynan's notion of pure cinema. The precision and consistency of Morrison's rendering give his unlikely compositions a deceptive, though welcome, sense of clarity. Yet for all their beauty, these are deeply unsettling paintings. Morrison's blacks and whites, and his snowy fields, make us obligated to read not painting, but nature, all over again. 1. Kenneth Tynan, "The Journals of Kenneth Tynan," New Yorker, 7 August 2000, 52. 2. This formal fluidity is often read as an ambiguity with cultural implications. See, for example, Color Me Blind! Malerei in Zeiten on Computergame und Comic, exh. cat., ed Ralf Cristofori (Cologne: Walther König, 1999). 3. See Bridget Riley: Ausgewählte Gemälde/ Selected paintings, 1961-1999, exh. cat. (Düsseldorf: Hatje Cantz, 1999), esp. 29-38, 125-29. 4. Raymond Watkinson, William Morris as Designer (New York: Reinhold, ), 48. 5. Paul Morrison, conversation with the author, April 2000. Linda Norden is Barbara Lee associate curator of contemporary art at Harvard University's Fogg Art Museum. 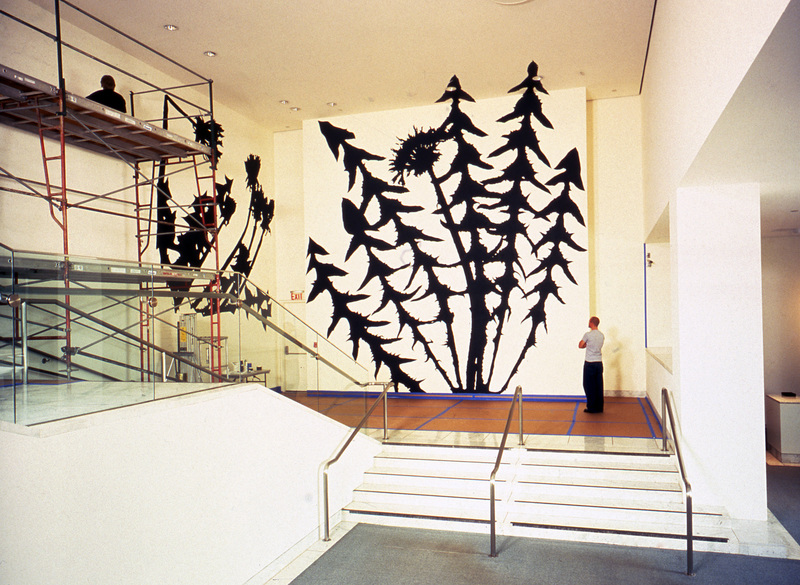 She recently invited Paul Morrison to make a three-part wall painting (Basin, 2000) for an exterior wall on Harvard's Le Corbusier-designed Carpenter Center for the Visual Arts. Hammer Projects: Paul Morrison is made possible with assistance from the British Council.